All our custom frame acrylic is custom sized for your artwork and paper masked for protection. It can be ordered as an optional component when ordering your frames as well as purchased separately. We recommend custom frame acrylic for fine art exhibitions because it is 1/2 the weight of glass and is virtually unbreakable. Making it easier and safer to transport and ship artwork for exhibitions. 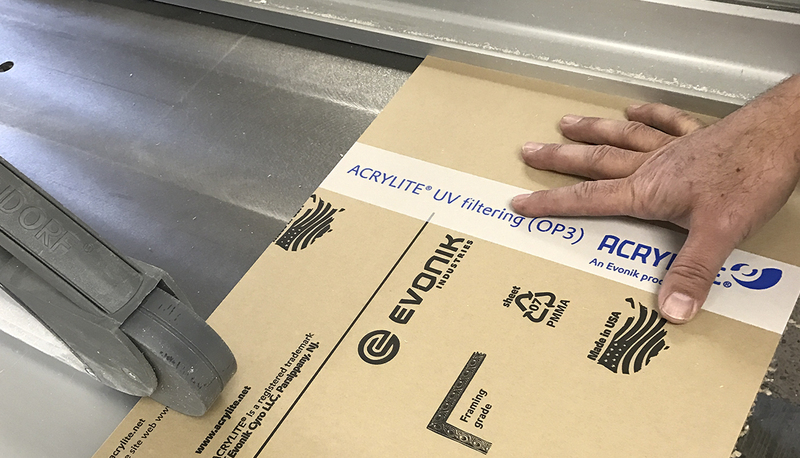 UV acrylic should be used when conservation issues are more important than price, The UV acrylic filters out 98 percent of damaging UV rays, protecting paper-borne artwork, prints and documents from fading, yellowing and brittling. Because the UV protection is part of the structure of the sheet, it can’t scratch off.